We are working hard at the farm and have started to harvest our coffee cherries and mamaki leaves now that our seedlings are starting to produce beautiful coffee cherries and mamaki leaves. Well, why not make a loose leaf tea we thought, so we’re doing just that. We’ve had so much fun expanding our Nuts N’ Such products and now experimenting with our ‘Teas From Trees’ product line. We are still in the developmental stages and having a great time sampling different flavor combinations from our own producing trees. What better incentive for a tea party? 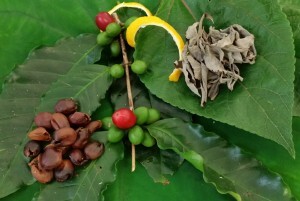 How about a tropical coffee cherry tea with hints of lemon and toasted coconut? Or perhaps a soothing cup of Hawaiian mamaki tea. Our coffee cherries and mamaki leaves will all be hand picked and processed in small batches to ensure the freshest possible products for you to enjoy. and speaking of trees -our macadamia nut trees are loaded and harvest season is just around the corner. We are excited for this upcoming harvest season!